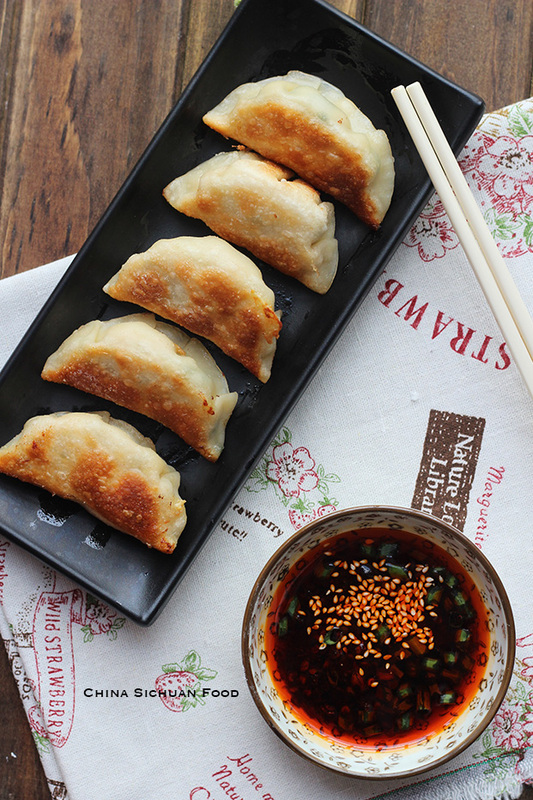 Learn how to make delicious pan-fried dumplings (also known as potstickers ) at home. Chinese dumplings are classified based on cooking methods. If you want to make boiled dumplings, check how to make Chinese dumplings. Boiled dumplings (水饺): for Chinese, dumplings are boiled dumplings in most cases, not pot-stickers and steamed dumplings. We have special name for those two types. 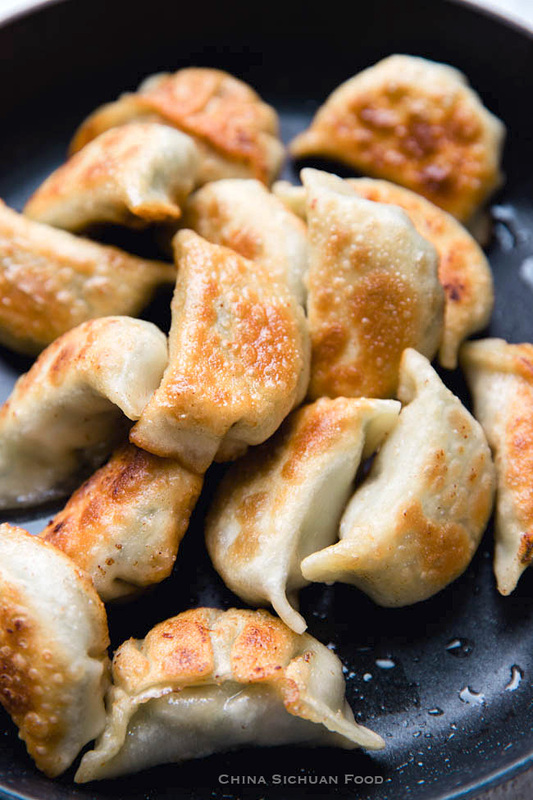 Boiled dumplings are soft, juicy and moist. In northern provinces, are considered as the staple food all year around. 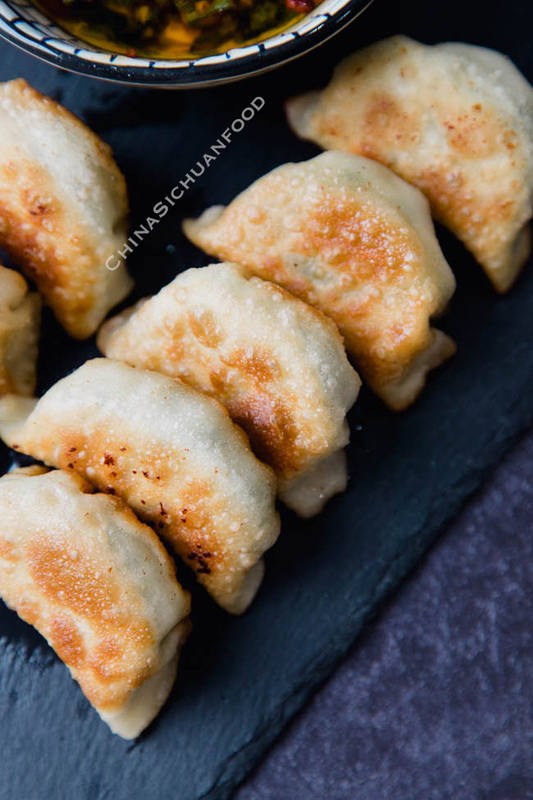 Pan-fried dumplings (potstickers, 锅贴) are crispy and chewier than boiled dumplings. 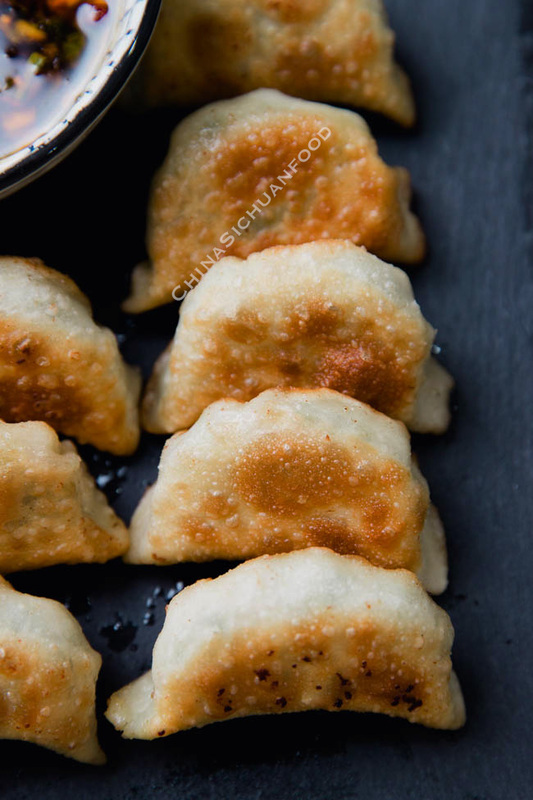 Pan-fried dumplings are popular across the country mainly as street foods or side dishes. Steamed dumplings (蒸饺): steamed dumplings are less famous compared with the two types above. In China, they are mainly served as side dish, dim sum or breakfast. Chive and pork is the perfect match for pot stickers. The aroma of leek goes really well in the flour wrapper, giving the dumpling strong aroma too after pan-fried or cooked in water. In Chinese spring festival, people around the whole country cook chive dumplings. However in daily life, I’d love to make dumplings with different stuffing and various dips. I use a spicy dip to strong the flavor of the stuffing. 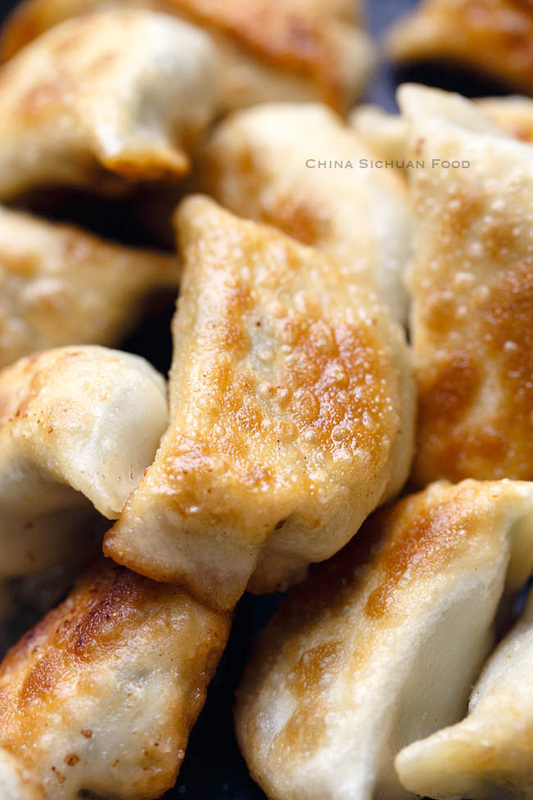 The surface of the pot stickers make today is really crispy. Fat content should be guaranteed|If possible, choose ground meat with at least 30% fat content. Marinate the ground meat a few hours prior to folding|Longer marinating time help the meat to absorb the seasonings. Mixing oil with chive before mixing with ground meat can prevent the chive dehydrating and help to keep the green color. Adjustments based on small differences between boiled dumplings and potstickers. 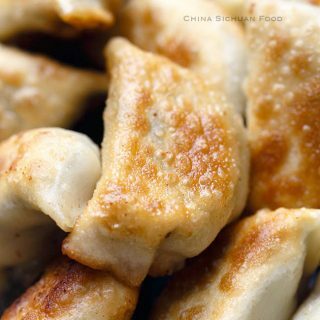 If you have decide to make this batch as potstickers, there are some of the tips for the filling. 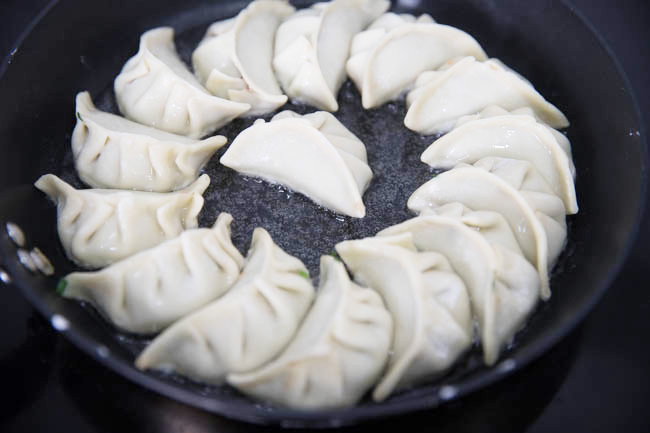 Instead of boiling in water, we use oil and pan-frying to cook the dumplings, the same filling can be a little bit more heavy in flavor and oily in texture. In order to correct this problem, I have two suggestions: use less salt and more vegetables comparing with boiled dumpling filling. In a mixing bowl, add ground pork, a small pinch of salt, ginger, egg, light soy sauce, white pepper, and then oyster sauce. Mix well. Then place the green onion on top and drizzle hot oil on green onions. This helps to improve the aroma of the green onion. Stir the filling in one direction for 2-3 minutes until getting a paste texture and the filling becomes quite sticky and lighter in color. Set aside for 1 hour or cover with plastic wrapper and overnight if you are not in a hurry. Finely chop chives and mix with 2 tablespoons of sesame oil or other vegetable oil. 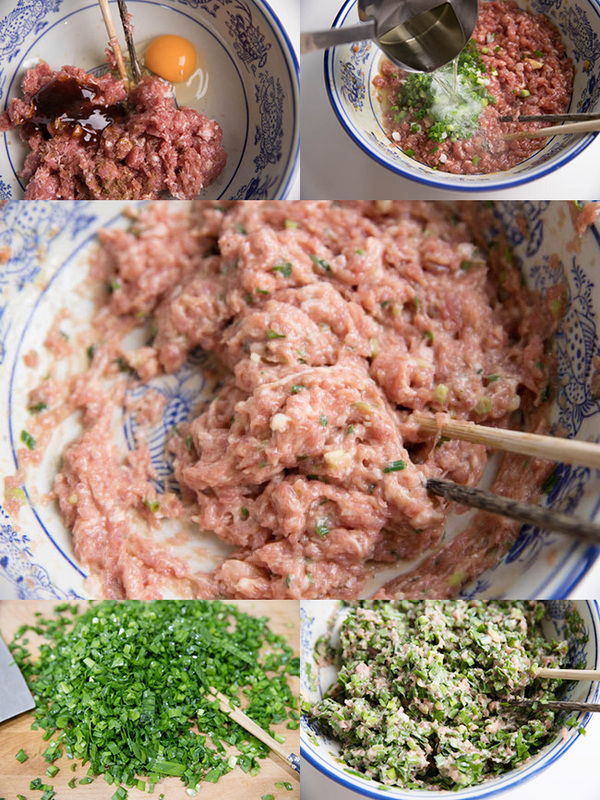 Mix chive with pork before wrapping. 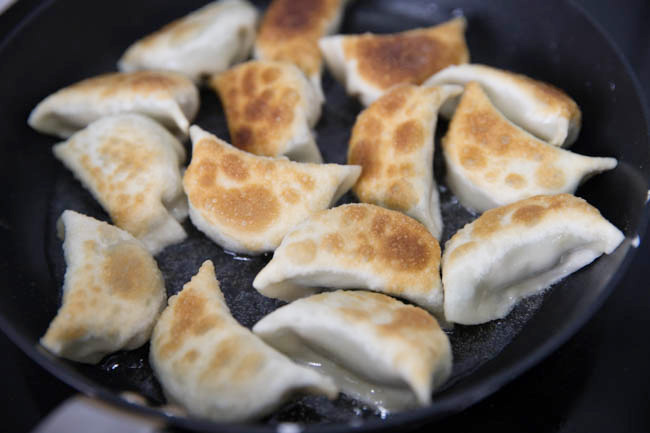 Generally, potstickers are folded as little moon for pot stickers. In China, we get around 10 ways of folding dumplings and little moon style is the most common used shape and considered as the most fitful for dried dumplings. fold one side of the wrapper against the other. Press the center together. began to make the pleats on one side. 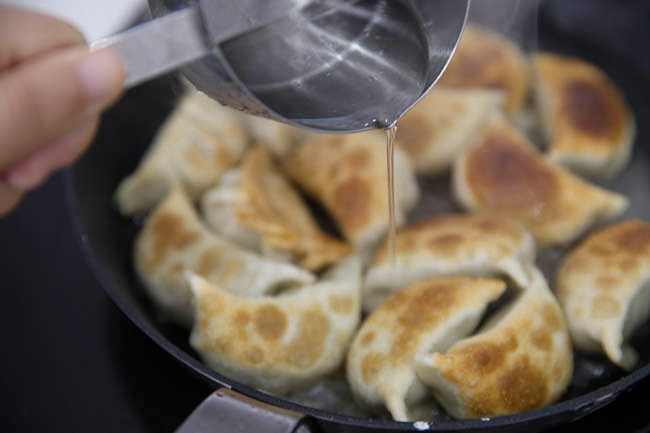 Pan-frying process: Add oil in a pan and lay the dumplings. Fry over medium fire until the bottom is golden brown. To make the dumplings even crisper, turn the dumplings over and fry the pleats side until slightly browned. Swirl around ¼ cup of water and then cover the lid immediately. Continue heating until all of the water is evaporated. Then all of the water is evaporated, continue cooking for a while until the shell becomes crispy again . Simple and step to step guide to make chive and pork pot sticker at home. In a mixing bowl, add ground pork, a small pinch of salt,ginger egg, light soy sauce, white pepper, and then oyster sauce . Mix well. Stir the filling in one direction for 2-3 minutes until getting a paste texture and the filling becomes quite sticky and lighter in color. Set aside for 1 hour or cover with plastic wrapper and overnight. Add around 1 tablespoon of oil in a pan (nonstick pan recommended for beginners), place the dumplings in. Pleats side up. Heat over medium fire until one side becomes browned. For a even crisper version, slow down the fire and turn over the dumpling and fry the pleats side until golden brown too.Swirl around 1/4 cup of water and then cover the lid immediately. Continue heating until all of the water is evaporated. Heat over slowest fire until the bottom becomes crispy and golden brown. Serve directly or dipping sauce.